My friend Ernie Kale and I spent a Friday afternoon and Saturday in the mountains, Alleghany and Ashe Counties, NC, and Grayson County, VA, in mid January. We had hoped for better weather, but, alas, it was rainy. But, photographers know that rain is not bad. The wetness often enhances color. 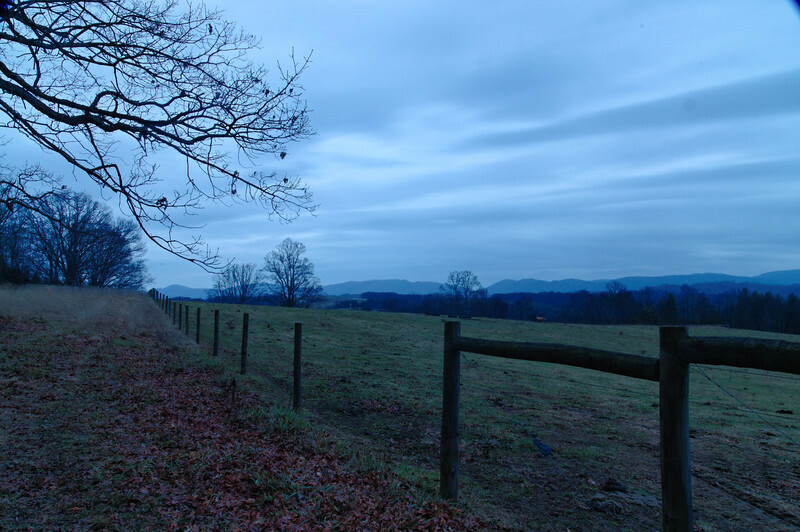 We began shooting at the Shelton Farm in Alleghany County at sunset on Friday, hoping we might get some good color. But, the clouds became heavier and the rain started just as we got set up. The next morning, we drove up the New River taking pictures in Ashe County and then drove to Volney, VA, and focused the rest of the day on VA Highway 58, which runs from Volney to Damascus, VA, passing Grayson Highlands State Park, White Top Mountain, and the Virginia Creeper Trail. Because of heavy rains, the creeks that run along side Highway 58 were really flowing, raging, if you will. We finished the day with shots from the Waddell Farm on Shippy's Branch Road, again hoping for some sunset color that never came. Ernie and I plan to focus on this section of Highway 58 as we believe there are many great pictures along this route.